This 30-Minute Pozole Recipe was inspired by a trip to Santa Fe, New Mexico. I dined at the Famous Plaza Café, Santa Fe’s oldest restaurant and ordered Pozole Pork for breakfast. The pozole verde was amazing! It had a wonderful clear broth, big pieces of shredded pork, and white hominy. It was so delicious that was inspired to come up with an authentic pozole recipe once I got home. There are three types of traditional New Mexican pozole - blanco/white, verde/green, and rojo/red. 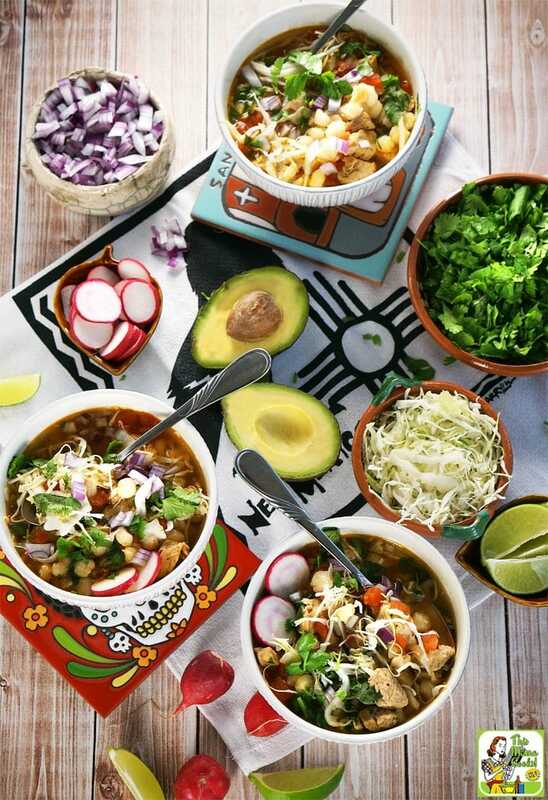 Green pozole adds green ingredients like tomatillos, cilantro, jalapenos, Anaheim peppers (also called New Mexican peppers) or pepitas (pumpkin seeds). Rojo pozole uses red chiles like ancho or chipotle. The kind I ate in Santa Fe was blanco pozole soup, which I had the option of turning into verde or rojo by adding the green or red chile. My pozole recipe is a combination of verde and rojo recipe since I used a can of tomatoes with jalapenos and ground chipotle. If you want your posole soup to look green, forgo the can of diced tomatoes and use some canned jalapenos or green chiles. When I was researching how to make pozole from the numerous New Mexican cookbooks I bought on my trip, I learned that you could make hominy from scratch. Hominy is corn that has been dried, then treated by soaking and cooking the corn n a solution of lye and slaked lime (calcium hydroxide).Luckily, you can get canned hominy at your grocery store and don’t have to bother making it from scratch. Canned hominy comes in white or yellow. My pozole recipe is made with white hominy, since the kind I had in Santa Fe also used white. But you can use yellow hominy if you think that’s prettier. 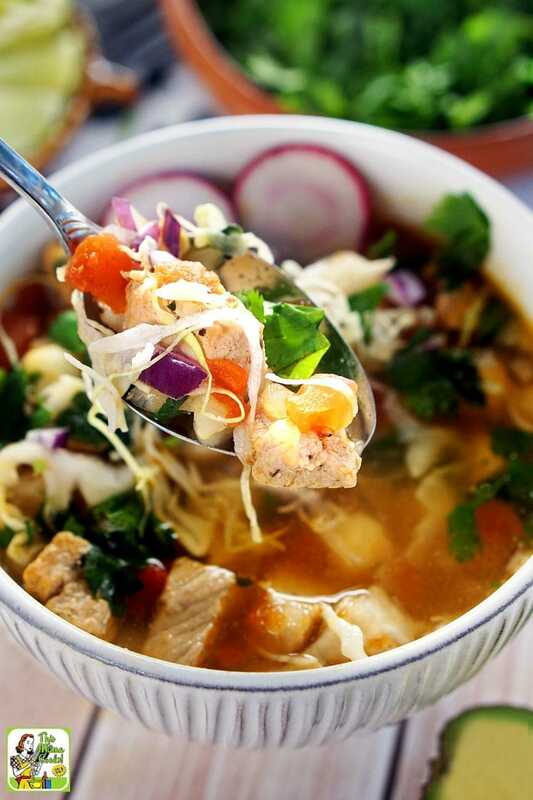 The cookbooks also pointed out that to get the best flavor, you had to cook the pozole ingredients for hours to mix the flavors of the spices, peppers, broth, pork, and hominy. I’m sure there had to be an easier way, which is why I bought already seasoned pork tenderloin to keep prep and cook time under 30 minutes. I also used bagged thinly sliced cabbage (usually used in coleslaw) so I didn’t have to get my food processor out. If you find the prepared onion too pricey at your grocery store, use a handheld food chopper to finely dice your onions. Much easier than cutting up the onion with a knife! If you’re gluten free, make sure that the chicken broth and the seasoned pork loin you’re purchasing are gluten free. Check the label carefully! 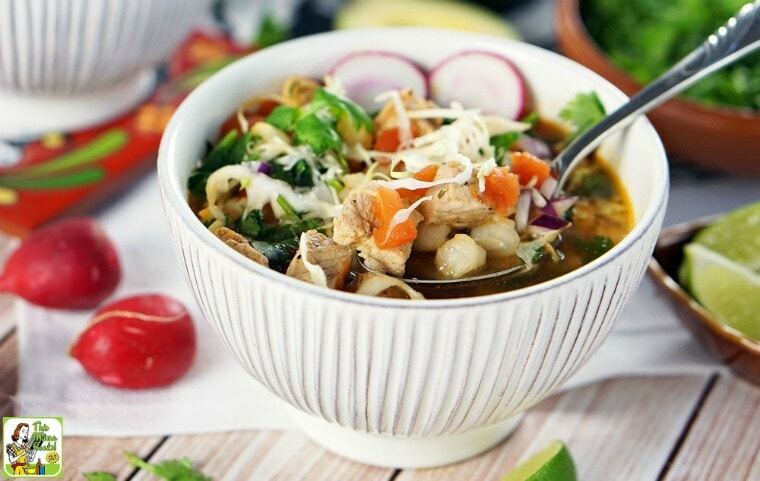 You can also use chicken in this pozole recipe. Sauté two pounds of diced chicken breast in some homemade taco seasoning and a little olive oil. Works great and doesn’t add much time to the cooking process. You’ll need a very large pot to make this Pozole Recipe. I used a 9-quart Dutch oven. My grocery store sells canned diced tomatoes with jalapenos and canned diced tomatoes with green chiles. I chose jalapenos because they’re not quite as hot as regular green chiles. I’m a wimp. Check out the Mexican/Hispanic section of your grocery store for ground chipotle and other spices. They’re often cheaper than the spices you find in the baking aisle. 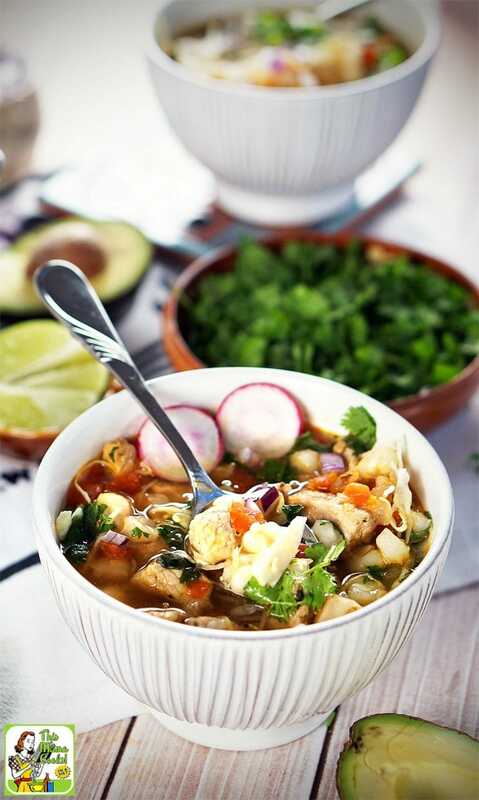 Speaking of spicy, serve this quick pozole recipe with your favorite Mexican hot sauce to make it even hotter! Finally, this pozole is hearty enough to be a meal on its own. If you need an extra little something, serve the pozole with tortilla chips and guacamole. Do you love spicy soup? Check out this Spicy Kale Soup Recipe! Sliced radishes, chopped cilantro, diced red onions, shredded cabbage, diced avocado, and slices of lime for serving. Heat the olive oil in a large soup pot or Dutch oven over medium high heat. Add the pieces of bite sized pork and stir so the pork doesn’t stick to the pot. Cook until browned – about 5-7 minutes. Remove pork from pan. Leave any liquid in pan and add onions. Cook until onions turn gold – about 5 minutes. Add salt and spices and cook until fragrant – 1 minute. Add chicken broth, hominy, and diced tomatoes. Turn up heat to high and bring posole soup to a boil. Lower heat and cover. Cook for 10 minutes. Ladle posole into bowls. Serve at the table with bowls of chopped cilantro, diced red onions, shredded cabbage, diced avocado, and slices of lime for garnishing. Encourage everyone to add more garnishes as they eat their posole! Originally posted on Jul 20, 2016. Updated with new information and pictures. Posted in Gluten Free, Recipes, Soups and tagged pork on January 30, 2018 by Anne-Marie Nichols. Previous post Make this Easy Nachos Recipe for your game watching party!